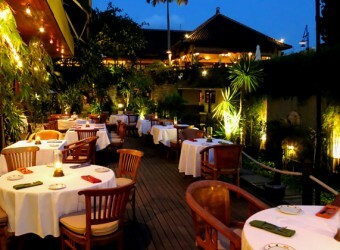 Bali Restaurant Papas Cafe in Alam KulKul Boutique Resort is an outdoor restaurant overlooking Kuta Beach that provides authentic Italian food. The restaurant using only fresh and selected ingredients, importing lettuce and vegetable seeds from Holland and grow it at Bedugul. Guests can enjoy dinner and watch beautiful sunset in Kuta Beach from the restaurant.